You know you want your own good-looking WordPress website, but you also know you don’t have the coding skills to build a theme for it from scratch. Happily, the WordPress community is large enough – and committed enough – to create a variety of free resources available to help users. One of these is the WordPress.org Theme Directory with over 3,000 free themes to choose from, all of which have been contributed by individual users and design companies. Then again, narrowing your choice down to “just” 3,000 themes may not seem like much help. Once again, don’t worry! We’ve gone through all the available options to find the 15 best free WordPress themes for you to choose from. How many active installations are there? What rating does the WordPress community give it? We excluded themes created by WordPress.com because by default, those are downloaded more often than others. Also, we didn’t include themes which hadn’t been rated by the WordPress community as there wasn’t enough information to make a judgment. For all the rest, we answered the three questions below to choose the best free WordPress themes. We looked at each theme’s features and functionality as well as its versatility for use by different websites such as ecommerce, food and drink, news, photography, and portfolios. Popularity isn’t everything, but it does count. A higher number of active installs shows people really are using a theme. WordPress users are not shy with their opinions. The ratings they give themes go a long way toward determining how well it’s been received within the WordPress community. One of the great things about WordPress is the ability to preview different themes before applying them to your site. No matter how much you may like a theme when you first see it, always preview how your site looks using it before switching from your old theme. GeneratePress, from the design firm of the same name, is one of the most powerful themes in this list. In addition to having features common to other entries – responsive design which makes it mobile-friendly, easily customizable, and compatible with all major WordPress plugins – it is also fully integrated with schema.org microdata which boosts responsiveness and communication with search engines. While other themes utilize Google Fonts, GeneratePress takes this one step further by offering full access to Font Awesome. Developers will love its built-in filters and hooks which will reduce development time. There are multiple dropdown menus, sidebar layouts, and widget areas. 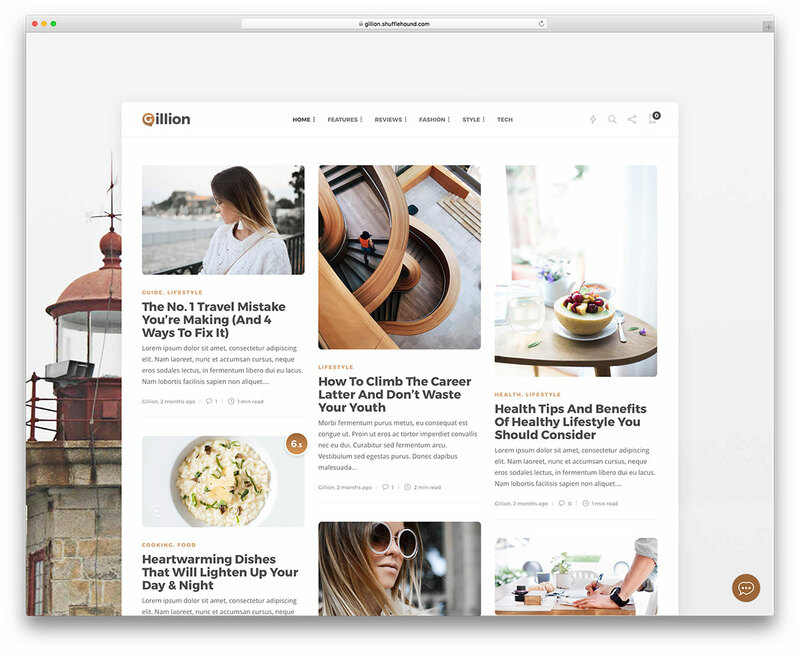 If you’re looking for a full-fledged theme with all the bells and whistles you could hope for, GeneratePress just might be it. Sydney is available from aThemes. Sporting a ton of customization options, it’s great for both businesses and portfolios. You’ll have full access to Google Fonts, complete color and layout control, a full-screen slider, and sticky navigation. It’s also translation-ready and features threaded comments. You’ll be able to incorporate parallax backgrounds and front-page blocks. You’ll keep your visitors engaged through the multiple social media icons and widgets. Plus, how can you say no to a design firm who has a blog post about the 6 best beer brewery WordPress themes? As its name suggests, ColorMag features a magazine-style design which is well-suited for news, magazine, or newspaper publishing. In fact, it’s the most popular magazine-newspaper theme available at WordPress.org. It comes with a left sidebar, and your choice of a one- or two-column layout. While print newspapers may be fading fast, ColorMag’s integration with WooCommerce will make it easy to monetize your site. You can also use your own customized code and allow users to share content via multiple social media channels. Plus, unlike many of the themes on this list, there is free support available at the ThemeGrill website. Available from HashThemes, Total does its best to be a one-size-fits-all website solution. It utilizes a clean, one-page design with unlimited color options, a sticky menu, animated text slider, and 10 homepage sections ranging from “About Us” to “Portfolio” to “Services” and more. And, yes, it’s compatible with WooCommerce. You can also have footer widgets, threaded comments, and a featured image. It’s translation-ready, too! Mesmerize, from the design firm of the same name, incorporates a drag-and-drop layout system which is quickly and easily customized. There’s a predesigned home page, 30 different content sections which are ready to use, and 5 header styles to choose from. Additional options for customization include either a slideshow or video background. Mesmerize is fully responsive and mobile-friendly as soon as you start using it. It’s also ready to use with WooCommerce straight out of the box. Produced by WP Royal, Ashe’s style is both elegant and minimal. As with many other themes on this list, it supports WooCommerce, and the responsive design is mobile-friendly. Language translation is built in as well as right-to-left (RTL) reading. It comes with plenty of documentation so even WordPress coding newbies will be able to easily customize it. There is also a full-screen slider, Instagram widget support, and retina display support. Okay, so Bulk doesn’t have quite as many ratings as most other themes in this list, but that’s probably because it’s relatively new. Made by Themes4WP, it was developed for use with the drag-and-drop page builder plugin Elementor. It’s translation-ready and is compatible with both WooCommerce and RTL. Its fully responsive design works well with its one-page layout. As you can tell by its name, Storefront is perfect for online sales, especially as it’s available from WooCommerce. Not only does it have WooCommerce bespoke integration, many of the WooCommerce extensions also come built in. Specifically designed to use succinct and compressed code, you can easily customize its extensible codebase. In addition, its deep WooCommerce integration means there is little to no downtime due to plugin and theme conflicts. Zerif Lite, from themeisle, uses BootStrap and has parallax support. It’s compatible with WooCommerce, RTL, and WPML. It also has enhanced search engine optimization (SEO). The one-page design incorporates responsive features which allow it to translate well to tablets, smartphones, and other mobile devices. When you decide to make changes to your website, you can see them in real time. Whether you’re showcasing your portfolio, corporate business, or web agency, it’s worth taking a look at Zerif Lite. Hestia, another themeisle contribution, has a multipurpose one-page design good for businesses or portfolios. You can use your own custom header, background, menu, and colors. You can also choose from either a one- or two-column layout. It’s compatible with WordPress’ WooCommerce plugin and ecommerce platform. Still not sold? A version of it is used by Jeremy Spencer, one of the founding members of the legendary rock band Fleetwood Mac! A FameThemes product, OnePress is a multipurpose one-page theme which is suitable for a variety of websites. It features a mobile-friendly responsive design, custom content blocks, parallax backgrounds, and an advanced theme customizer. Out of all the themes in this list, this one is an excellent example of how Bootstrap 4 WordPress can be thoroughly integrated with WooCommerce. Want more? OnePress easily translates into the language of your choice, has advanced HTML5 functionality, and is rigorously tested for compatibility with all major browsers. FameThemes boasts over 78,000 satisfied customers, thanks in no small part to the superior support it provides. ColorLib is a prolific developer of WordPress themes, and Shapely is one of its more accomplished efforts with its pixel-perfect design and numerous customization options. Sure, it supports WordPress widgets like WooCommerce, but that support extends to JetPack, Google Analytics by Yoast, Gravity Forms, and more. You also have access to Font Awesome vector graphics, unlimited color options, and detailed theme documentation to provide the support you’ll need to take full advantage of its versatility. PageSpeed bills itself as the fastest and most robust SEO WordPress theme available. This SwiftThemes product has a clean design which effectively incorporates negative space and loads in less than a second, according to Pingdom. All this speed does not sacrifice customization as you can have sticky sidebars and navigation, integrate Google Fonts, and incorporate a featured post slider. It’s coded to official WordPress standards and is compatible with WooCommerce, AdSense, Beaver, and Elementor. Consulting, from Think Up Themes, is the free version of Consulting Pro, and both are excellent options for an ecommerce or services site. Consulting incorporates a responsive design, is HD-ready for retina displays, and allows you to quickly add social media sharing icons. Plus, it has powerful built-in widgets for cloud tags and Flicker feeds. If you upgrade to Consulting Pro, additional powerful features become available: access to unlimited colors, your choice of full-width or boxed layout, and a library of over 100 custom shortcodes. And, with the full version, there is robust support to help you should you need it. When choosing from the best free WordPress themes, function should always dictate form. Even if you’re taken by a particular theme – c’mon, who doesn’t love Zombie Apocalypse? – it may not automatically work well for your ecommerce site. Or, maybe you know you’ll need more additional tech support than providers of free themes usually offer. In that case, you should look at the paid commercial themes also available at the WordPress.org Theme Directory. Want to see even more great free WordPress themes? Check out these additional examples! When it comes to web publishing solutions and platforms, there are dozens of options available. Of all the solutions out there, though, the pure simplicity of Wix and WordPress has made them two of the most popular around. Like with any head-to-head comparison, there are going to be devotees on both sides of the issue, each staking a claim to the best product. We don’t want to get into that territory in this Wix vs. WordPress discussion – instead, we’re going to lay out the pluses and minuses of each platform so that you can get a clear picture of why they’re both favorable, but just for different purposes. We’ll also try to keep technical jargon to a minimum, instead focusing on the strengths, weaknesses and unique features that each has to offer. Every generation of web tools gets a little more intuitive and easier to use, and Wix and WordPress are no exception. There’s a visual interface that’s very user-friendly, and as simple as just clicking, then doing a drag-and-drop. It’s a quick, painless process for designing and publishing a site, even for novices who have no idea of the nuts and bolts (and code) that goes into a website. In addition, there’s Wix ADI (Artificial Design Intelligence), which is applicable for most website templates, including Business, Blog, Portfolio, and CV. To sum up, Wix is easy to use no matter what part of the process you’re in – whether creating your account and site, changing a page’s background, connecting a custom domain or adding new content or a blog post, it can all be done with just a few clicks. WordPress, on the other hand, comes in second in any Wix vs WordPress consideration of simplicity and ease of use. It doesn’t offer the same streamlined workflow as Wix and offers only a CMS for content. When it comes time to add any visual content, you may need to actually use some code with WordPress, another key difference as compared to Wix. In addition, WordPress doesn’t include hosting, so WordPress users would need to find their own hosting service and update software manually, as well as possessing at least some knowledge of HTML and CSS. WordPress may have gotten its start in the blogging world, but it quickly began to add features and is now a great platform for all kinds of websites, from portfolios to e-commerce stores. WordPress offers commenting systems, SEO-enhancement packs, safety plugins, social plugins and much more. Their e-commerce features include multiple payment options, product options, coupon sales and even tax management tools. If you’d like to put together your own website community for regular visitors, you can build a simple forum within the Wix-based website, where people can meet and discuss. Again, Wix has the advantage when it comes to ease of use for these features. When you decide on Wix, you have your choice of hundreds of ready-made website templates across more than 70 different industries and categories. If you’re in need of a landing page, you can choose from a number of one-page templates and blank templates that give the site structure but still have no content in them yet. There’s just one problem – Wix users can’t switch templates when they’re partly through the editing process. WordPress also offers plenty of themes and templates, either in independent marketplaces and theme shops or from the WordPress.org theme directory. Unlike Wix, though, WordPress doesn’t offer WYSIWYG editing, meaning once again that you’ll have to be at least somewhat conversant in code. This is kind of a tough call in the Wix vs WordPress debate. Wix has a huge support center, with over a quarter million topics in their official user support forum, hundreds of tutorials and walkthrough videos, email support and even an entire academy at WixEd. There are also plenty of prompts in the editor itself, with help icons on just about every element in the platform’s control panel. WordPress doesn’t offer any official staff for customer support, but – considering how prevalent WordPress is in the web design world, there is no shortage of webmasters and other WordPress experts out there who can offer great advice and support. A Google search for WordPress forums should get you the results you need. Wix or WordPress? Your Call. In the end, whether you go Wix vs WordPress - is up to you. Each has its advantages and its drawbacks, but for a novice designer, Wix might prove to be the platform that’s easier to master. It offers definite pluses when it comes to simplicity of use and user-friendliness. But then again, as you gain more advanced skills in web design and management, you will find that WordPress will ultimately be a better platform in the end. So, really, it comes down to: Are you a beginner or do you have a little more experience and a little knowledge of HTML? If so – go with WordPress.